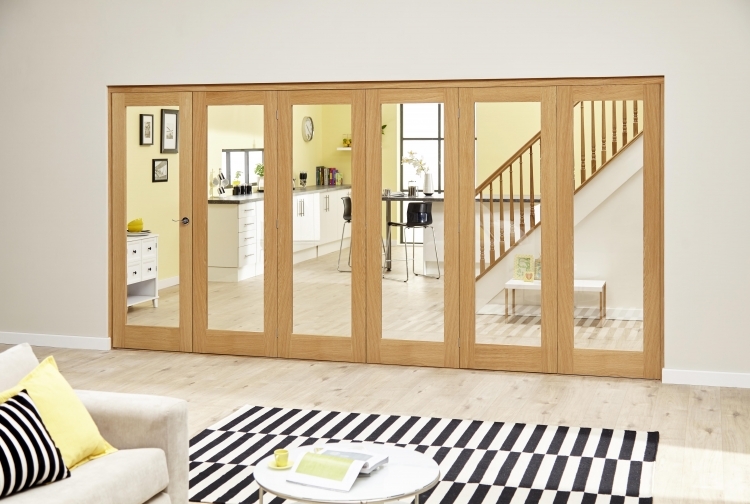 These glazed oak roomfold deluxe doors by Climadoor help you to enjoy a flexible living space. As with all our internal bifold doors, you can fold them back to open up space or close to divide between rooms. The clear glazing gives you maximum light flow and creates a feeling of space by allowing you to see adjoining rooms. We offer slimline and standard options to help you create the look you’re after. The slimline option has 60mm door styles to maximise the glass area, whilst the standard door styles are 100mm. These roomfold deluxe doors are top hung with a base track, low-level threshold, guides, and drop bolts. This adds to rigidity without hindering the door’s smooth operation. As you’d expect from Climadoor, the prices are unbeatable but there’s no compromise on quality. You can choose from 3, 4, 5, and 6 door combinations in a variety of widths to find just what you’re looking for. This set consists of a Frame pack, doors, hinges, running gear, head and base track/threshold and drop bolts and is provided in an easy to assemble kit form. A joiner is recommended for installation. Roomfold deluxe doors are a part of the Climadoor internal bifold doors range. Unlike the roomfold standard range, the roomfold deluxe is a top hung system that also comes with a base track and guides. These doors also come in a wider selection of panel sizes and width options than the standard range. This allows you to find an exact fit for a whole host of door opening sizes. These doors are supplied in unfinished oak. This means that the wood needs to have a protective coating applied before installation. When you receive your unfinished doors they should be stored flat but slightly raised from the ground in a dry place. They should be decorated as soon as possible to avoid moisture imbalances. We recommend applying at least 3 coats to unfinished doors, usually, one base coat followed by two top coats. All surfaces and edges should be finished, even areas that can’t be seen as this will stop moisture getting into the wood. If unfinished doors are not finished before installation this will invalidate the guarantee, so be sure to allocate appropriate time for finishing these doors. If you’d prefer a door that’s already been factory finished, take a look at our prefinished glazed oak roomfold deluxe option.